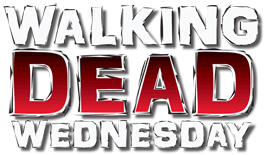 On The Walking Dead, Shane was a villain because he became attracted to another man's wife, then tried to get rid of him so they could be together. Boo Shane! By contrast, when the survivors get to Alexandria, Rick became attracted to another man's wife, then tried to get rid of him so they could be together. Yay Rick! When I pulled this figure from the case, I didn't know who it was. I didn't remember Kurt Cobain being in The Walking Dead, but it would certainly explain all the blood. It wasn't until I realized that the other figure wearing a bloody poncho in this set was her hated son Sam (hated by the audience, not by her) that it clicked for me who this was. Jessie, on the show, has that sort of hot plainness that makes it no surprise Rick would want her from the start. Her actress, Alexandra Breckenridge, was also the maid on the first season of American Horror Story, which I only mention because HOT DAMN! 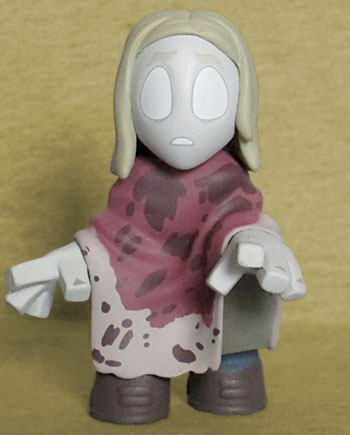 Can we get Mystery Minis of that, Funko? 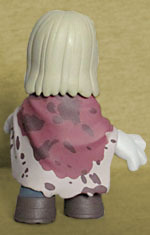 Clearly this figure is based on Jessie's death scene, what with the guts-covered shroud and all, and she's posed with her hands held out. Like we said, this series also includes her walker-bait youngest son, Sam, and it seems like a missed opportunity that their hands aren't quite posed to hold one another. The grue on her cloak is all paint, not sculpted, with a large red splotch covering most of it, and darker spots splattered about. There is a little bit of variation in the application of the stains - not every Jessie is 100% identical, thanks to some variance in the placement and crispness of the apps. The interior of her robe is just flat shapes, not a body tucked way back beneath. Jessie is available in a 1:24 ratio, meaning that rather than being in every case, she's in every other - on the top layer, in the back right corner. Her son Sam is also 1:24, so he takes her spot in the alternating cases.